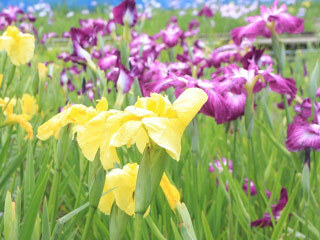 Kawazu Iris Garden (かわづ花菖蒲園) is one of the best Iris spot in Shizuoka. It has 60 kinds 12,000 Iris flowers. Unlike others that bloom in middle of June, Iris of this garden bloom from the middle of May to early June. There are so many different kinds of beautiful Iris you can enjoy. Admission: 200 yen for adult. Free for under Junior high. 1. use Izukyu Line to Kawazu Station. Usually, Iris blooms in middle of June, but here at Kawazu Iris Garden use warm weather and Onsen water, they bloom very early, from May to the middle of June. It has 12,000 Iris flowers.